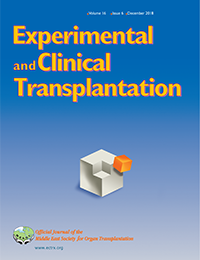 The journal is fully indexed in EBSCO, PubMed, Journal Citation Reports/Science Edition, MEDLINE, Science Citation Index Expanded™, and Turkey Citation Index. Experimental and Clinical Transplantation is pleased to welcome all future manuscript submissions online. Please submit your next manuscript via Manuscript Central at http://mc.manuscriptcentral.com/ect. 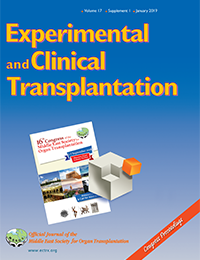 Experimental and Clinical Transplantation (ECT) is the official journal of the Middle East Society for Organ Transplantation (MESOT). The Society was originally founded in Turkey in 1987, and was subsequently incorporated at Bern, Switzerland, in 1988 as a non-profit, international, scientific organization comprising 20 countries of the Middle East, North Africa, Mid-Asia, and neighboring nations. The Journal expects that all procedures and studies involving human subjects have been reviewed by the appropriate ethics committee and have therefore been performed in accordance with the ethical standards laid down in The Helsinki Declaration as well as The Declaration of Istanbul on Organ Trafficking and Transplant Tourism. Manuscripts must contain a statement to this effect.